If you are looking for a compact vehicle that can keep up with your workload, look no further than the Hyundai Veloster. The vehicle boasts a tremendous variety of performance features that can help you get to where you need to go in comfort and style. 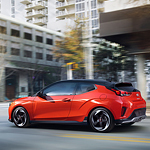 The Veloster features a powerful 2-liter four-cylinder engine that is capable of putting out upwards of 147 horsepower. This ample power delivery adds a desirable degree of control over all driving situations. Drivers who had the chance to test the vehicle were pleased with the handling over similar vehicles. Accurate steering, powerful brakes, and a comfortable handling all combine to provide owners with an impeccable driving experience. Those who want to explore their options further should be sure to check out their local Hyundai dealer. You could be test driving the Hyundai Veloster at your earliest convenience.